Transcription factor AML1/Runx1, initially isolated from the t(8;21) chromosomal translocation in human leukemia, is essential for the development of multilineage hematopoiesis in mouse embryos. AML1 negatively regulates the number of immature hematopoietic cells in adult hematopoiesis, whereas it is required for megakaryocytic maturation and lymphocytic development. However, it remains yet to be determined how AML1 contributes to homeostasis of hematopoietic stem cells (HSCs). To address this issue, we analyzed in detail HSC function in the absence of AML1. Notably, cells in the Hoechst 33342 side population fraction are increased in number in AML1-deficient bone marrow, which suggests enrichment of quiescent HSCs. We also found an increase in HSC number within the AML1-deficient bone marrow using limiting dilution bone marrow transplantation assays. These results indicate that the number of quiescent HSCs is negatively regulated by AML1. Mammalian hematopoietic development is believed to derive from two distinct cellular origins. In mice, generation of the primitive erythroid lineage consisting of large and nucleated erythrocytes, known as primitive hematopoiesis, occurs around day 7.5 postcoitus in the yolk sac (1). The second wave of hematopoiesis, which is called definitive hematopoiesis and consists of enucleated erythrocytes, myeloid cells, and lymphoid progenitors, emerges later in the fetal liver around day 9.5 postcoitus and results in expansion of hematopoietic stem cells (HSCs)3 and generation of blood cells (2, 3). At the center of stem cell self-renewal and lineage commitment decisions lie the precisely regulated expression levels of lineage-specific transcription factors. The role of specific transcription factors in hematopoietic stem cell fate decisions has derived largely from genetic strategies, primarily gene-targeting and transgenic or retroviral overexpression experiments. From the growing body of experimental results, several transcription factors have been found to play critical roles in hematopoietic stem cell physiology. Transcription factor AML1, also known as RUNX1, CBFA2, or PEBP2αB, is initially isolated from the breakpoint of t(8;21) chromosomal translocations found in acute myelogenous leukemia (AML) (4) and is recognized as one of the most important transcription factors which regulate mammalian hematopoietic homeostasis. AML1 is specifically required for the development of definitive hematopoiesis in the embryonic stage as shown by gene-targeting experiments in mice (5, 6). In contrast, as we and others have previously shown, loss of AML1 in the adult stage does not cause complete loss of hematopoiesis (7, 8, 9). AML1-deleted adult mice show a decrease in platelets due to a maturational defect of the megakaryocytes as well as block of lymphocyte development, while the fraction of immature hematopoietic progenitors is expanded (7). These results suggest that AML1 is not required for the maintenance of HSCs, but for the differentiation and maturation of more committed cells. It is also suggested that embryonic development of hematopoiesis and maintenance of adult hematopoiesis is, respectively, regulated by distinct molecular mechanisms, which is also supported by analyses on conditional knockout mice which target hematopoietic genes, such as SCL and NOTCH1 (10, 11). Impaired function of AML1 in the hematopoietic system is associated with a variety of human hematological malignancies including t(8;21)-positive AML, immature-type AML defined as M0 by French-American-British classification (12), myelodysplastic syndromes (13), and familial platelet disorder with propensity to AML (14). Mice with bone marrow cells that express leukemic chimeric protein AML1/ETO (AML1/MTG8) produced by t(8;21) chromosomal translocation do exhibit a myeloproliferative phenotype, which was susceptible to the development of leukemia when the mice were treated with alkylating agents to induce additional genetic aberrations (15, 16, 17, 18, 19). Because AML1/ETO acts dominant-negatively over normal AML1 function, the myeloproliferative phenotype has been explained by the expansion of the HSC fraction in these mice caused by suppressed AML1 activities. As is recently reported, however, introduction of a splicing variant form of AML1/ETO in the bone marrow cells causes the development of leukemia in mice independently of second-hit mutations by alkylating agents (20). In addition, AML1-deficient bone marrow cells fail to show infinite replating capacity in contrast to AML1/ETO-expressing bone marrow cells (7). Therefore, the expansion of hematopoietic stem cells of AML1/ETO may not be caused only by suppression of AML1 function, but other molecular pathways used by the ETO portion are necessary for the development of leukemia. In contrast to our observation that AML1- deficient bone marrow contains expanded hematopoietic progenitors, it has been reported that bone marrow cells with the heterozygously inactivated AML1 locus show a decrease in competitive repopulating capacity (21) and lower chimerism in long-term competitive repopulation assays (9), Therefore, it is essential to know whether deletion of AML1 causes expansion of the most primitive hematopoietic stem cells to understand the molecular mechanisms of hematological malignancies related to abnormal AML1 functions. To address this issue, we analyzed in detail HSC function in the absence of AML1 using conditional AML1 knockout mice. AML1 conditional knockout mice (7) were crossed with Mx-cre transgenic mice (22) and maintained at the C57BL/6J background at the Section of Animal Research, Division of Research Resources and Support, Center for Disease Biology and Integrative Medicine, Faculty of Medicine (University of Tokyo, Tokyo, Japan). C57BL/6J mice were purchased from Clea Japan. Mice congenic for the Ly5 locus (C57BL/6-Ly5.1), bred and maintained at Sankyo Labo Service (Tsukuba, Japan), were provided by Dr. H. Nakauchi (Institute of Medical Science, University of Tokyo, Tokyo, Japan). The genotypes of the wild-type AML1 (AML1wt), loxP-flanked (AML1fl), and deleted (AML1−) loci were analyzed using genomic PCR primers as described previously (7). 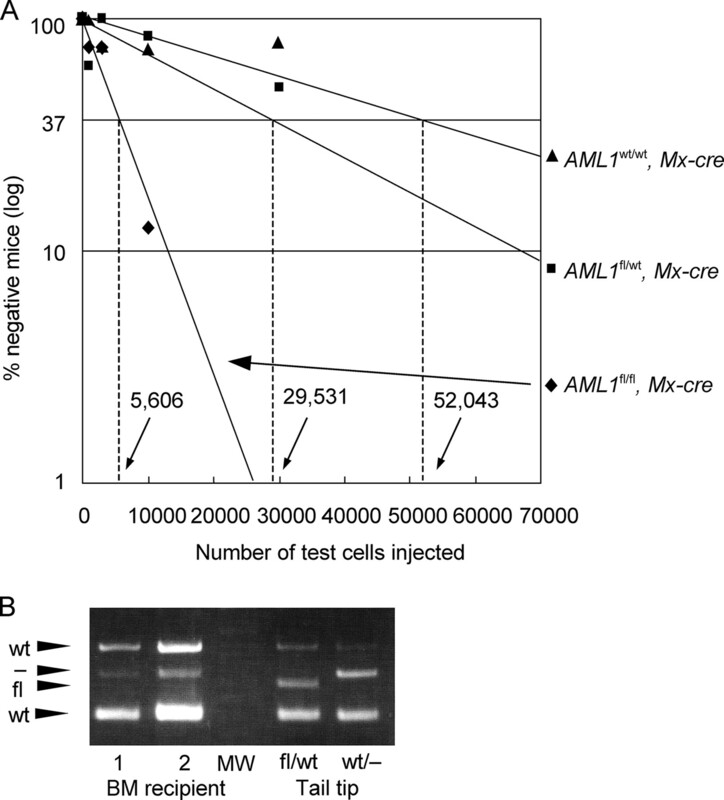 To induce excision of AML1 in the adult mice, AML1fl/fl Mx-cre-transgenic mice were i.p. injected with poly(I:C) (Sigma-Aldrich) along with littermate control mice at the age of 5–10 wk, and bone marrow cells were collected 4–9 wk after poly(I:C) injection. The age of mice was between 12 and 19 wk at the time of bone marrow collection. In limiting dilution bone marrow transplantation assays, 500 μg of poly(I:C) was injected seven times on alternate days to maximize the gene deletion. Because a high dose of poly(I:C) caused exhaustion of some mice, 250 μg of poly(I:C) was administered three times (days 1, 3, and 5) in other experiments, since this administering schedule caused effective deletion of the AML1 locus (7). All animal studies were approved by the institutional review board, following institutional guidelines for animal researches. Bone marrow cells were collected by flushing the femurs and tibiae of the mice with 22-gauge needles into 5 ml of RPMI 1640 medium supplemented with 2% FBS and nucleated cells were counted. For transplantation, nucleated cells were counted as indicated and i.v. injected into lethally irradiated (9 Gy) female, 8- to 10-wk-old C57BL/6J mice. The x-ray irradiation was performed using MBR-1505R2 apparatus (Hitachi Medical). For transplantation of retrovirus-transduced hematopoietic cells, C57BL/6-Ly5.1 mice were i.p. injected with 150 mg/kg 5-fluorouracil (Sigma-Aldrich). Five days after injection, mononuclear cells from two to four mice were precultured in a cytokine-containing medium for retrovirus infection overnight and transduced with retrovirus medium for 3 days. Transduced cells were purified with FACSAria flow cytometer using “yield” mode at a purity of 70–90%, and 3–4 × 105 purified cells were coinjected with 1 × 105 normal C57BL/6J bone marrow cells to irradiated (9 Gy) C57BL/6J recipient mice. Bone marrow cells from one femur and two tibiae were collected into 1 ml of RPMI 1640 medium supplemented with 2% FBS, and the genomic DNA was purified from 100 μl of cell suspension using an MFX-9600 apparatus and a NPK-391 magnetic bead-based genomic DNA extraction kit (Toyobo) according to the manufacturer’s instructions. Chimerism assays using real-time PCR were done as previously described (23). Briefly, male bone marrow cells were serially diluted with female bone marrow cells (to contain 0, 0.1, 0.3, 1, 3, 10, 30, and 100% of male cells) for establishing standard curves, and the genomic DNA was subjected for real-time PCR amplification for Zfy2 (primers 5′-TGG AGA GCC ACA AGC TAA CCA-3′ and 5′-TCC CAG CAT GAG AAA GAT TCT TC-3′) and GAPDH (primers 5′-GGA GAT TGT TGC CAT CAA CG-3′ and 5′-GTC TCG CTC CTG GAA GAT GG-3′) using the SYBR Green PCR reagent kit (Invitrogen Life Technologies) and Applied Biosystems 7000 Sequence Detector. For each sample and standard mixture, cycle threshold readings (Ct) were determined using the Sequence Detection Software (Applied Biosystems) and the ΔCt (= (Ct for Zfy2) − (Ct for GAPDH) amplified from each of the same sample) value was calculated. A standard curve was generated by plotting the known percentage of male DNA to the logarithmic y-axis and ΔCt values to the linear x-axis. The detection limit of male cells in this assay was estimated to be ∼0.3%. Excision of the Aml1 locus was confirmed for the samples with high male chimerism using nested PCR as described previously (7). Staining bone marrow cells for Hoechst 33342 side population (SP) cell fraction and G0 cell cycle fraction was done as described previously (24, 25, 26). Flow cytometry was performed using BD LSR II apparatus (BD Biosciences) for nonsorting analyses and FACSAria apparatus (BD Biosciences) for sorting experiments. The following mAbs were used for analyses on hematopoietic stem cells: FITC-conjugated rat mAb to CD34 (clone RAM34; BD Biosciences), PE-conjugated Ab to Sca-1 (clone D7; BD Biosciences), biotin-conjugated Ab to CD3ε, CD4, CD8a, B220, Gr-1, Mac-1, and TER-119 (clones 145-2C11, RM4-5, 53-6.7, RA3-6B2, RB6-8C5, M1/70, and TER-119; all from BD Biosciences, except for CD8a and Gr-1 Abs from eBioscience) visualized by PerCP-conjugated streptavidin; BD Biosciences) and allophycocyanin-conjugated Ab to c-Kit (clone 2B8; BD Biosciences). For the analysis of the G0 cell cycle status of the cells in the KSL fraction, cells were first stained with FITC-conjugated Ab to lineage Ags listed above (all from BD Biosciences, except for TER-119 Ab from Medical & Biological Laboratories) and negative fraction was collected using MACS anti-FITC Ab and an AutoMACS apparatus (Miltenyi Biotec) according to the manufacturer’s instructions. c-Kit-positive cells were then collected using a MACS anti-c-Kit Ab and AutoMACS (Miltenyi Biotec) and stained for allophycocyanin-conjugated Ab to Sca-1 (clone D7; eBioscience) and pyronin-Y. Cell cycle status was assayed for cells in the FITC-negative, allophycocyanin-positive gates. For other sorting analyses, cells were stained using FITC-conjugated Ab to CD34, PE-conjugated Ab to CD16/32 (FcγRIII/II; clone 2.4G2; eBioscience), biotin-conjugated lineage Ag listed above followed by visualization with SA-PerCP, PE-Cy7-conjugated Ab to Sca-1 (clone E13-161.7; eBioscience), and allophycocyanin-conjugated Ab to c-Kit. For analyzing lineage-negative (Lin−) cells, dead cells were excluded from analyses along with lineage-positive cells by staining the cells with 7-aminoactinomycin D (7-AAD, Via-Probe; BD Biosciences). Acquired data were analyzed using FACSDiva or CellQuest software (BD Biosciences). Determined numbers of cells were collected in IMDM supplemented with 2% FBS and cultured in MethoCult GF M3434 methylcellulose-based medium (Stem Cell Technologies) per the manufacturer’s instructions. Cell clusters consisting of 50 cells or more were counted as colonies and colonies were differentially scored according to their morphology at day 7 of culture. Mouse AML1 cDNA was subcloned into pGCDNsam-IRES-GFP (a gift from Dr. H. Nakauchi, Institute of Medical Science, University of Tokyo, Tokyo, Japan), and viral supernatants from the empty vector (mock) and AML1 vector were produced using the MP34 packaging cell line as previously described (27). Transduction was performed using Retronectin (Takara Bio) according to the manufacturer’s instructions in RPMI 1640 supplemented with 10% FBS, 10 ng/ml mouse stem cell factor, 6 ng/ml mouse IL-3, and 10 ng/ml mouse IL-6 (cytokines provided by Kirin Brewery) at a cell density of ∼10,000–40,000 cells/well on 24-well nontreated culture plates (Nunc) for purified hematopoietic progenitor cells or 4–8 × 105 cells/well on 6-well nontreated culture plates (Nunc) for nonsorted mononuclear cells. Three days after culture in the retrovirus-containing medium, cells were sorted using FACSAria for GFP positivity. Competitive repopulating units (CRUs) were calculated using the StatMod package for the GNU R statistical analysis software. Flow cytometry data from mouse littermate pairs were first examined using the F test for equality of variance and then compared using the paired or unpaired t test if applicable. When equality of variance was rejected, paired data were tested by Wilcoxon’s signed rank test. We previously reported the increased cell number of the CD34−, Lin−, c-Kit+, and Sca-1+ (CD34− KSL) fraction, in which long-term hematopoietic stem cells are concentrated in the bone marrow of the conditional knockout mice that delete AML1 after birth (7). AML1-deficient cells contribute to the granulocytic lineage of the recipient mice more efficiently than control cells at 1 mo after transplantation, when both of them are transplanted into lethally irradiated mice in the competitive repopulation experiments. However, the contribution of the AML1-deficient cells to granulocytes in the peripheral blood tends to decrease over time (7). Therefore, we sought to determine precisely whether HSCs are increased in the bone marrow of AML1-deficient mice. We crossed conditional AML1 knockout mice with loxP-flanked exon 5 in the AML1 locus (AML1fl, Fig. 1⇓A) (7) with IFN-inducible Mx-cre-transgenic mice (22) to generate AML1fl/fl Mx-cre mice, in which we can induce AML1 excision at the adult stage by injecting poly(I:C). Although deletion of the loxP-flanked AML1 loci in the bone marrow cells was almost complete after three injections of poly(I:C) at a dose of 250 μg, we used a higher dose (seven injections of 500 μg of poly(I:C)) in transplantation experiments to maximize the gene deletion, because a trace number of HSCs may expand and affect the data. AML1wt/wt Mx-cre mice or AML1fl/fl mice without the Mx-cre transgene were treated with poly(I:C) and used as controls. HSCs that can reconstitute adult hematopoiesis for a long term are concentrated in the Hoechst 33342 SP fraction, which represents quiescent stem cells with the ability to efflux the dye at a greater rate than the other major part of the cells (main population) (24). Although the total number of cells in the AML1-deficient bone marrow was not significantly different from that of conditional knockout (cKO: 4.73 ± 2.11 × 107 vs control: 5.74 ± 2.86 × 107, p = 0.50), the SP cell fraction within the bone marrow cells and the absolute number of SP cells per mouse was significantly increased in AML1-deficient mice compared with control mice, suggesting that quiescent HSCs are increased in the absence of AML1 (Fig. 1⇓, B and C). Among SP cells, quiescent HSCs are known to be further concentrated in the fraction that has the CD34− KSL surface marker phenotype (CD34− KSL SP cells) (26). 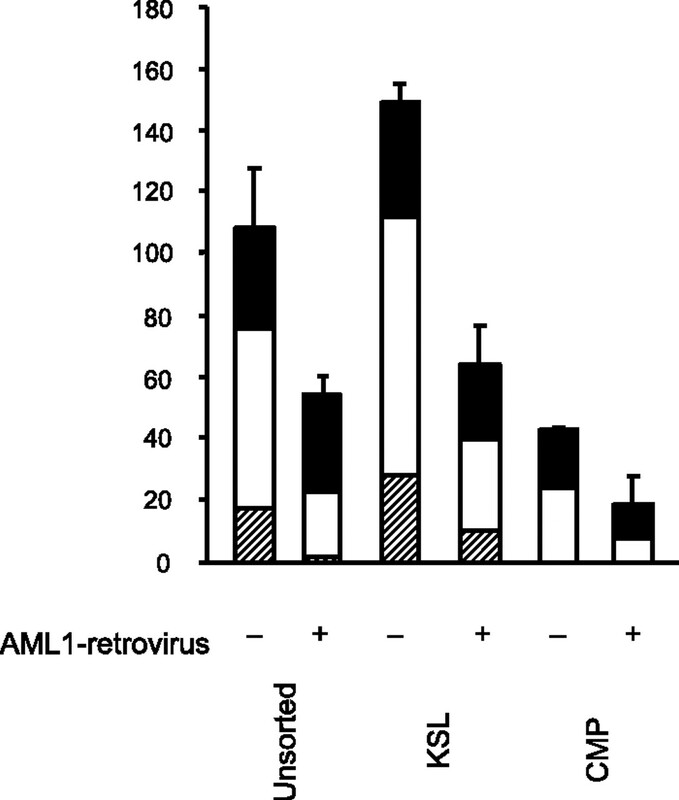 CD34− KSL SP cells were also increased in the AML1-deficient mice (Fig. 1⇓, B and D), again indicating the increase in the quiescent HSC number in the AML1-deficient bone marrow. Given the elevated number of SP cells in the absence of AML1, we next analyzed the cell cycle status of immature hematopoietic cells to determine the number of cells within the G0 state. We stained the bone marrow cells with a stem cell-related surface marker c-Kit, DNA dye Hoechst 33342 and RNA dye pyronin-Y. As shown in Fig. 2⇓A, the G0 fraction defined as cells that show 2n DNA content by Hoechst 33342 staining and low RNA by pyronin-Y staining is also increased in the c-Kit+ bone marrow cells of AML1-deficient mice. We then sorted KSL cells, in which HSCs are concentrated, and found an increase of the G0 KSL cells in the AML1-deficient mice (Fig. 2⇓B), indicating that loss of AML1 causes an increase of immature hematopoietic cells in the quiescent state. 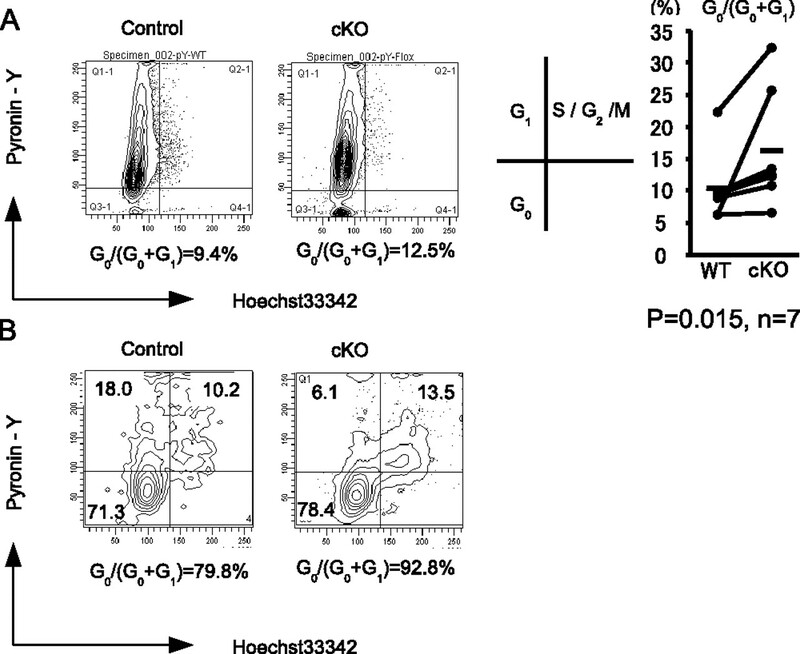 Hoechst 33342 SP analysis of the bone marrow cells from conditional AML1 knockout (cKO) mice. A, Schematic representation of the cKO alleles. 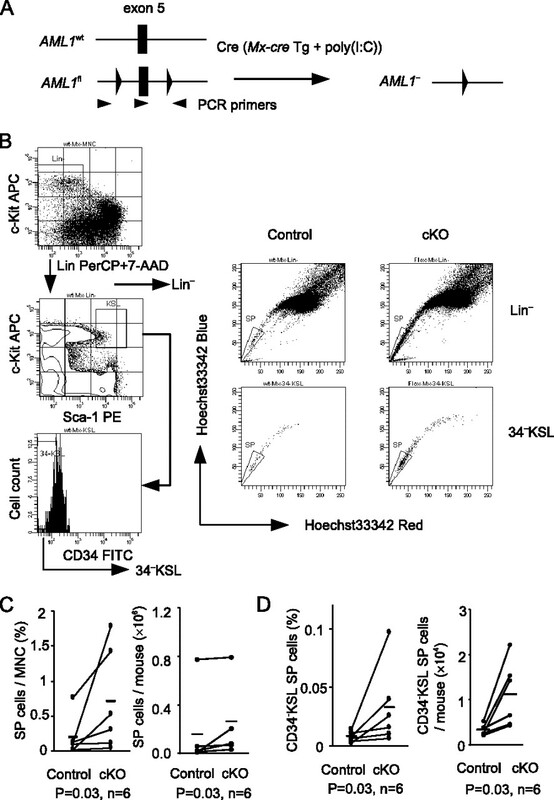 B, SP cell profiles of Lin− and CD34− KSL populations from cKO and control mice. C and D, Statistical analyses of the SP fraction from cKO and control bone marrow cells. Percentage of cells in the SP fraction (shown in B) from each paired (cKO and control littermates) experiments are displayed as paired data. C, Numbers of the Lin− SP cells (frequencies within mononuclear gates and absolute numbers per mouse). D, SP fraction cells within CD34− KSL cells as frequencies within mononuclear gates and absolute numbers per mouse. Mean SP percentages are shown as bars in these graphs. Because equality of the variance of the data were rejected by the F test, p values were calculated using Wilcoxon’s signed rank test. Tg, Transgenic. G0 cell cycle analyses on the c-Kit+ bone marrow cells from cKO mice. A, Bone marrow cells from cKO and control mice that are c-Kit+ are assayed for G0 cell fractions. G0 and G1 cells were gated according to Hoechst 33342 fluorescence. G0 cells were defined as cells the p-Y fluorescence of which is below those of G2-M cells (Hoechst-high cells). The value of p was calculated using Wilcoxon’s signed rank test. B, Similar assays were performed on bone marrow cells sorted by Lin−c-Kit+ cells and stained with allophycocyanin-conjugated Ab to Sca-1. Representative data within Sca-1+ gates from two independent experiments. Because the fractions in which HSCs are concentrated have increased in the AML1-deficient mice, we assessed CRUs contained in the AML1-deficient mice using a bone marrow transplantation assay with limiting dilution to determine the frequency of long-term HSCs (28). Bone marrow cells from AML1fl/fl Mx-cre, AML1fl/wt Mx-cre, or AML1wt/wt Mx-cre male mice treated with poly(I:C) were serially diluted, cotransplanted with 2 × 105 female competitor bone marrow cells into the lethally irradiated wild-type female C57BL/6J mice, and then donor cell chimerism was evaluated in the reconstituted bone marrow. Because nucleated cells in the peripheral blood are predominantly lymphocytes in mice and AML1-deficient lymphocyte progenitors show maturation block at early stages (7, 9), we used bone marrow cells rather than peripheral blood cells for the analysis for repopulation to avoid underestimation. At 4 mo after transplantation, genomic DNA was purified from the bone marrow cells. Donor cell chimerism was assayed using quantitative real-time genomic PCR targeted for the Zfy locus, which is specific for the Y chromosome (23). Mice with ≥1% test cell chimerism were treated as positive for donor cell engraftment, and CRUs were evaluated using proportions of engrafted mice and numbers of transplanted cells (28). As shown in Table I⇓and Fig. 3⇓A, there was ∼10-fold increase in CRUs in AML1-deficient bone marrow in comparison to control mice. PCR genotyping confirmed almost complete deletion of the AML1 locus of the AML1fl/fl Mx-cre bone marrow cells (Fig. 3⇓B). CRUs in the bone marrow of mice with heterozygously deleted AML1 locus (AML1fl/wt Mx-cre mice treated with poly(I:C)) showed a slight but not statistically significant increase in number compared with control mice. These results indicate that loss of AML1 causes expansion of long-term HSCs in the bone marrow. Limiting dilution analysis based on competitive repopulation. A, Varying numbers of bone marrow cells from male AML1fl/fl, Mx-cre (♦), AML1fl/wt, Mx-cre (▪), or AML1wt/wt, Mx-cre (▴) mice were mixed with 2 × 105 bone marrow cells from female C57BL/6J mice and injected into lethally irradiated C57BL/6J female mice. Reconstitution in the bone marrow was evaluated at 4 mo after transplantation. Mice were considered negative when the percent chimerism was <1.0. Estimated frequencies of the repopulating cells are indicated as vertical dashed lines (1 repopulating cell per indicated numbers of bone marrow cells) for each genotype. Representative data from two independent experiments are shown. B, Genomic PCR analysis of the bone marrow cells reconstituted by AML1fl/fl, Mx-cre mice in the same experiment (two lanes at the left). Control PCR fragments using tail tip DNA from AML1fl/wt and AML1wt/− mice (two lanes at the right) are also displayed to indicate the position of the PCR products generated from each type of AML1 allele. wt, Wild type. Because the number of hematopoietic stem cells appeared to be inversely correlated to the attenuated doses of AML1, we next examined the effect of forced expression of AML1 on HSC activity. Bone marrow cells from Ly5.1+ C57BL/6 congenic mice were transduced with retroviruses expressing GFP alone or along with AML1 (27). After the infection, GFP+ cells were sorted and i.v. injected into lethally irradiated Ly5.2+ wild-type C57BL/6J mice along with supporting cells. Four weeks after transplantation, donor cell chimerism in the bone marrow was assayed by flow cytometry using isotypes of CD45 (Ly5) and positivity of GFP. Although all six mice showed a distinct contribution of GFP+Ly5.1+ cells in the mock-infected group, GFP+ cells were detected in none of six mice transplanted with AML1-overexpressing cells (Fig. 4⇓). These results indicated that the elevated dose of AML1 prevents hematopoietic cells from reconstituting the bone marrow of the recipient mice, again suggesting that AML1 negatively regulates hematopoietic stem cells. Hematopoietic reconstitution by AML1-overexpressing bone marrow cells. Bone marrow cells from C57BL/6-Ly5.1 mice were infected with mock or AML1-expressing retrovirus containing GFP, collected for expression of GFP and transplanted into C57BL/6J (Ly5.2) mice. Reconstituted bone marrow cells at 4 wk after transplantation were stained with 7-AAD viability dye and PE-conjugated Ab to Ly-5.1 (CD45.1). Representative dot plots within 7-AAD-negative cell gates are shown. We have previously shown that myeloid CFUs are increased when evaluated using the whole bone marrow cells of AML1-deficient mice, indicating that loss of AML1 results in an increased number of myeloid progenitors (7). These findings were consistent with another report showing that the granulocyte-macrophage progenitors (GMPs; Lin−Sca-1−c-Kit+CD34+FcγRIII/IIhigh) are increased upon deletion of AML1 in adult mice (9). Nonetheless, neutrophil counts in the peripheral blood remain unchanged in AML1-deficient mice (7). These observations allowed us to examine whether altered dosages of AML1 confer any qualitative change on the defined populations of myeloid progenitors as seen in HSCs. For this purpose, we purified each population that contains myeloid progenitors from the bone marrow and evaluated the colony-forming capacity of those cells with methylcellulose-based cultures. As is consistent with the previous report, the proportion of GMPs was elevated in the absence of AML1 (9). In addition, we found that the proportion of common myeloid progenitors (CMPs; Lin−Sca-1−c-Kit+CD34+FcγRIII/IIlow) was also slightly but significantly elevated from poly(I:C) injection by analyzing AML1-deficient mice after 4–9 wk (Fig. 5⇓, A and B). The total number of these progenitor cells from AML1-deficient mice was also increased, although increase in the GMP cells was not significant. 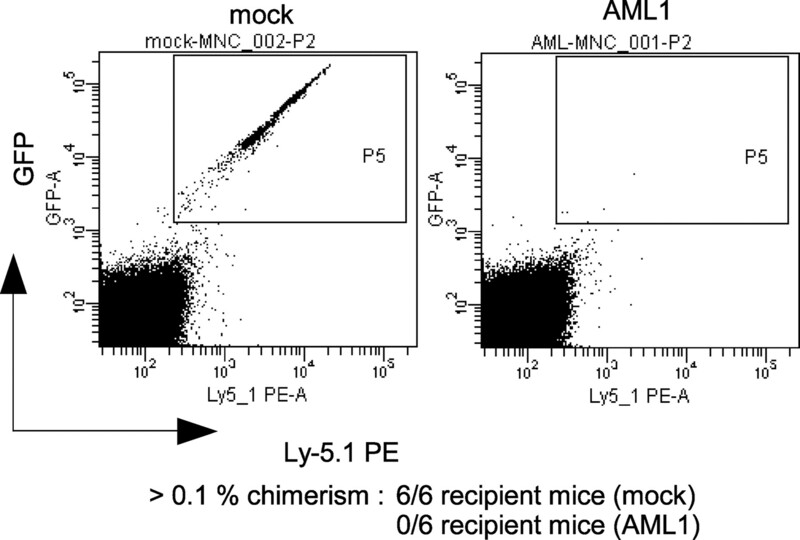 These results indicate that the numbers of CMPs were negatively regulated by AML1. However, when the same number of KSL cells, CMPs, and GMPs were seeded onto methylcellulose-containing medium, colony-forming capacities were not significantly different even in the absence of AML1, indicating that loss of AML1 does not affect the quality of these progenitor populations (Fig. 5⇓C). Taken together with the above findings, these results suggest that the elevated frequencies of committed progenitors in AML1-deficient bone marrow are mainly the consequences of the increased number of HSCs rather than cell-autonomous or stage-specific changes in committed progenitors. Colony-forming capacity of myeloid progenitors from cKO mice. A, Sorting gates of KSL, CMP, and GMP cells from control and cKO mice. B, Frequencies of the progenitors (KSL, CMP, GMP, and MEP for megakaryocyte/erythrocyte progenitors). C, Numbers of the progenitors (KSL, CMP, GMP, and MEP) per mouse calculated as products of the frequencies of the progenitors and the numbers of the total bone marrow cells per mouse. Data are also shown as mean ± SD (n = 7 for KSL, n = 3 for others) Asterisks indicate p < 0.05 by paired t test. D, Colony-forming capacity of myeloid progenitor cells. Cells sorted using the gates shown in A were cultured in a methylcellulose-containing medium and scored according to their morphology on day 7 of culture. ▨, mixed colonies; □, myeloid colonies, and ▪, erythroid (BFU-E and CFU-E) colonies. Typical colony numbers from three independent duplicate experiments are shown. Error bars, SDs. WT, Wild type. Next, we examined the effect of overdosage of AML1 on myeloid progenitors. Unsorted cells, KSL cells, and CMPs obtained from bone marrow cells of wild-type C57BL/6J mice were transduced with mock or AML1-expressing retrovirus. Infected cells were sorted for GFP positivity and seeded onto methylcellulose-based medium. As shown in Fig. 6⇓, KSL and CMP cells that were transduced with AML1-overexpressing retrovirus formed fewer colonies than control cells, indicating that overexpression of AML1 attenuates the proliferating capacity of these cells. Colony-forming capacity of myeloid progenitors overexpressing AML1. Each myeloid progenitor fraction from wild-type bone marrow cells was sorted and transduced with mock or AML1-expressing retrovirus. GFP+ cells were sorted and cultured for 7 days in methylcellulose-containing medium supplemented with cytokines. ▨, mixed colonies; □, myeloid colonies; and ▪, erythroid (BFU-E and CFU-E) colonies. Typical colony numbers from three independent duplicate experiments are shown. Error bars, SDs. In this article, we have found that in vivo long-term HSC activity is inversely correlated with the dosage of AML1. HSCs identified phenotypically in terms of dye efflux or cell cycle status are also increased upon deletion of AML1, which indicates that AML1 negatively regulates the number of quiescent HSCs. Increase in the quiescent fraction of HSCs in the AML1-deficient bone marrow suggests that the expansion of HSCs is not due to compensation of the differentiation block in the myeloid lineage, but the consequence of altered intrinsic transcriptional mechanisms that are physiologically regulated by AML1. Additionally, our current study shows that overexpression of AML1 in the bone marrow cells impairs hematopoietic reconstitution as well as colony-forming capacities, again suggesting that the dosage of AML1 directly regulates HSC activity. The current observations appear to be in contrast to a previous report showing that mice that congenitally lack AML1 in one allele contain fewer CRUs than control mice (21). This difference may depend on the time when deletion of AML1 occurs. We analyzed HSC activity immediately upon loss of AML1 by using mice that lack AML1 in an inducible fashion after birth. Mice with hemizygous levels of AML1 show aberrant distribution of definitive HSCs during embryogenesis (29), and factors like this may modify the property of HSCs in the adult stage in heterozygously AML1 knockout mice. It is known that mice that lack CBFβ, a functional partner of AML1, phenotypically recapitulate AML1 knockout mice, showing total loss of definitive hematopoiesis. A recent report using CBFβ hypomorphic mice revealed that 15% of the wild-type level of CBFβ is sufficient for emergence of definitive hematopoiesis (30). In this report, attenuated doses of CBFβ between 15 and 30% of wild type cause expansion of hematopoietic stem/progenitor cells in neonates, which return to normal when CBFβ is restored up to the hemizygous level. These facts are compatible with our findings that a reduced level of AML1 results in the expansion of HSCs after birth, although the amount of CBFβ may not linearly correlate with AML1 function. Our observation is also consistent with the earlier in vivo studies in which immature hematopoietic cells were shown to expand when they are introduced with AML1/ETO chimeric protein that represses the function of normal AML1 (15, 16, 17, 18, 19). A report by another group that also analyzed conditional knockout mice of AML1 suggests that loss of AML1 does not affect long-term HSC activity, although they do not directly estimate the frequency of HSCs in the bone marrow (9). They also reported that AML1-deficient HSCs show impaired chimerism in the competitive transplantation assays. In this respect, we previously showed that the long-term myeloid-repopulating capacity of AML1-deficient cells, as measured by donor cell chimerism in the peripheral blood at 3 mo, is no better than that of control cells in the competitive transplantation assays (7). Therefore, subtle block of myeloid differentiation, which cannot be detected in in vitro colony-forming assays, may exist and impair myeloid cell reconstitution in the absence of AML1. In addition, given that CRUs in the AML1-deficient bone marrow are ∼10 times higher compared with the control bone marrow, mean activity of stem cells, which is indicated as repopulating units per CRU (31), may be diminished in the absence of AML1. Another difference between the two studies is that they did not detect any increase in the proportion of CMPs in the AML1-deficient bone marrow as is contrasted with our results. This may be due to the difference in the periods from AML1 deletion to the analysis (4–9 wk vs 17–39 wk), although there are other possibilities. Given that loss of AML1 causes expansion of HSCs in adult bone marrow, genetic aberrations involving AML1 found in human leukemias may also promote expansion of leukemic stem cells by inhibiting AML1 function, although it remains yet to be determined whether normal and leukemic stem cells are maintained through similar molecular mechanisms. Elucidation of such mechanisms would be a clue to a more precise understanding of normal hematopoiesis and hematological malignancies. Analyses on mutant mice have shown that various genes, including those for transcription factors, cell surface ligands, their cognate receptors, cell cycle proteins, and molecules involved in signal transduction, control the HSC pool size (reviewed in Ref. 32). AML1 is documented to regulate the expression of target genes that act mainly in committed hematopoietic cells, such as IL-3, myeloperoxidase, neutrophil elastase, M-CSF receptor, GM-CSF, TCRs (reviewed in Ref. 33), Ig α-chain (34, 35, 36), and λ5 (37). In contrast, little is known about candidates for transcriptional targets of AML1 in adult HSCs. The regulatory mechanism of transcription through which AML1 controls the size of the HSC pool remains an unanswered question that should be elucidated in future studies. In this study, we have explicitly shown that AML1 negatively regulates the number of HSCs in the quiescent state in adult hematopoiesis. Expansion of the immature hematopoietic cells caused by disruption of AML1 function may be involved in the pathogenesis of hematological malignancies associated with altered AML1 function. We thank H. Nakauchi for the retrovirus vector and C57BL/6-Ly-5.1-congenic mice, R. Kühn and J. Takeda for the Mx-cre-transgenic mice, N. Watanabe and T. Kitamura for the protocol for retroviral transduction, and Y. Sawamoto and Y. Shimamura for technical assistance. ↵1 This work was supported in part by grants from the Ministry of Education, Culture, Sports, Science and Technology (KAKENHI 18013014 to M.K. ), Japan Society for the Promotion of Science (Grant-in-Aid for Fellows 17-10666 to M.I. ), and the Ministry of Health, Labour and Welfare (Health and Labour Sciences Research Grants to M.K.). ↵3 Abbreviations used in this paper: HSC, hematopoietic stem cell; 7-AAD, 7-aminoactinomycin D; SP, side population; KSL, lineage-negative, c-Kit-positive, and Sca-1-positive; cKO, conditional knockout; CRU, competitive repopulating unit; Ct, cycle threshold; GMP, granulocyte-macrophage progenitor; CMP, common myeloid progenitor. Dzierzak, E., A. Medvinsky. 1995. Mouse embryonic hematopoiesis. Trends Genet. 11: 359-366. Medvinsky, A., E. Dzierzak. 1996. Definitive hematopoiesis is autonomously initiated by the AGM region. Cell 86: 897-906. Muller, A. M., A. Medvinsky, J. Strouboulis, F. Grosveld, E. Dzierzak. 1994. Development of hematopoietic stem cell activity in the mouse embryo. Immunity 1: 291-301. Miyoshi, H., K. Shimizu, T. Kozu, N. Maseki, Y. Kaneko, M. Ohki. 1991. t(8;21) breakpoints on chromosome 21 in acute myeloid leukemia are clustered within a limited region of a single gene, AML1. Proc. Natl. Acad. Sci. USA 88: 10431-10434. Okuda, T., J. van Deursen, S. W. Hiebert, G. Grosveld, J. R. Downing. 1996. AML1, the target of multiple chromosomal translocations in human leukemia, is essential for normal fetal liver hematopoiesis. Cell 84: 321-330. Wang, Q., T. Stacy, M. Binder, M. Marin-Padilla, A. H. Sharpe, N. A. Speck. 1996. Disruption of the Cbfa2 gene causes necrosis and hemorrhaging in the central nervous system and blocks definitive hematopoiesis. Proc. Natl. Acad. Sci. USA 93: 3444-3449. Ichikawa, M., T. Asai, T. Saito, S. Seo, I. Yamazaki, T. Yamagata, K. Mitani, S. Chiba, S. Ogawa, M. Kurokawa, H. Hirai. 2004. AML-1 is required for megakaryocytic maturation and lymphocytic differentiation, but not for maintenance of hematopoietic stem cells in adult hematopoiesis. Nat. Med. 10: 299-304. Putz, G., A. Rosner, I. Nuesslein, N. Schmitz, F. Buchholz. 2006. AML1 deletion in adult mice causes splenomegaly and lymphomas. Oncogene 25: 929-939. Growney, J. D., H. Shigematsu, Z. Li, B. H. Lee, J. Adelsperger, R. Rowan, D. P. Curley, J. L. Kutok, K. Akashi, I. R. Williams, et al 2005. Loss of Runx1 perturbs adult hematopoiesis and is associated with a myeloproliferative phenotype. Blood 106: 494-504. Mikkola, H. K., J. Klintman, H. Yang, H. Hock, T. M. Schlaeger, Y. Fujiwara, S. H. Orkin. 2003. Haematopoietic stem cells retain long-term repopulating activity and multipotency in the absence of stem-cell leukaemia SCL/tal-1 gene. Nature 421: 547-551. Osato, M., N. Asou, E. Abdalla, K. Hoshino, H. Yamasaki, T. Okubo, H. Suzushima, K. Takatsuki, T. Kanno, K. Shigesada, Y. Ito. 1999. Biallelic and heterozygous point mutations in the runt domain of the AML1/PEBP2αB gene associated with myeloblastic leukemias. Blood 93: 1817-1824. Imai, Y., M. Kurokawa, K. Izutsu, A. Hangaishi, K. Takeuchi, K. Maki, S. Ogawa, S. Chiba, K. Mitani, H. Hirai. 2000. Mutations of the AML1 gene in myelodysplastic syndrome and their functional implications in leukemogenesis. Blood 96: 3154-3160. Song, W. J., M. G. Sullivan, R. D. Legare, S. Hutchings, X. Tan, D. Kufrin, J. Ratajczak, I. C. Resende, C. Haworth, R. Hock, et al 1999. Haploinsufficiency of CBFA2 causes familial thrombocytopenia with propensity to develop acute myelogenous leukaemia. Nat. Genet. 23: 166-175.
de Guzman, C. G., A. J. Warren, Z. Zhang, L. Gartland, P. Erickson, H. Drabkin, S. W. Hiebert, C. A. Klug. 2002. Hematopoietic stem cell expansion and distinct myeloid developmental abnormalities in a murine model of the AML1-ETO translocation. Mol. Cell. Biol. 22: 5506-5517. Fenske, T. S., G. Pengue, V. Mathews, P. T. Hanson, S. E. Hamm, N. Riaz, T. A. Graubert. 2004. Stem cell expression of the AML1/ETO fusion protein induces a myeloproliferative disorder in mice. Proc. Natl. Acad. Sci. USA 101: 15184-15189. Schwieger, M., J. Lohler, J. Friel, M. Scheller, I. Horak, C. Stocking. 2002. AML1-ETO inhibits maturation of multiple lymphohematopoietic lineages and induces myeloblast transformation in synergy with ICSBP deficiency. J. Exp. Med. 196: 1227-1240. Yuan, Y., L. Zhou, T. Miyamoto, H. Iwasaki, N. Harakawa, C. J. Hetherington, S. A. Burel, E. Lagasse, I. L. Weissman, K. Akashi, D. E. Zhang. 2001. AML1-ETO expression is directly involved in the development of acute myeloid leukemia in the presence of additional mutations. Proc. Natl. Acad. Sci. USA 98: 10398-10403. Higuchi, M., D. O’Brien, P. Kumaravelu, N. Lenny, E. J. Yeoh, J. R. Downing. 2002. Expression of a conditional AML1-ETO oncogene bypasses embryonic lethality and establishes a murine model of human t(8;21) acute myeloid leukemia. Cancer Cell 1: 63-74. Yan, M., E. Kanbe, L. F. Peterson, A. Boyapati, Y. Miao, Y. Wang, I. M. Chen, Z. Chen, J. D. Rowley, C. L. Willman, D. E. Zhang. 2006. A previously unidentified alternatively spliced isoform of t(8;21) transcript promotes leukemogenesis. Nat. Med. 12: 945-949. Sun, W., J. R. Downing. 2004. Haploinsufficiency of AML1 results in a decrease in the number of LTR-HSCs while simultaneously inducing an increase in more mature progenitors. Blood 104: 3565-3572. Kuhn, R., F. Schwenk, M. Aguet, K. Rajewsky. 1995. Inducible gene targeting in mice. Science 269: 1427-1429. Muskiewicz, K. R., N. Y. Frank, A. F. Flint, E. Gussoni. 2005. Myogenic potential of muscle side and main population cells after intravenous injection into sub-lethally irradiated mdx mice. J. Histochem. Cytochem. 53: 861-873. Goodell, M. A., K. Brose, G. Paradis, A. S. Conner, R. C. Mulligan. 1996. Isolation and functional properties of murine hematopoietic stem cells that are replicating in vivo. J. Exp. Med. 183: 1797-1806. Arai, F., A. Hirao, M. Ohmura, H. Sato, S. Matsuoka, K. Takubo, K. Ito, G. Y. Koh, T. Suda. 2004. Tie2/angiopoietin-1 signaling regulates hematopoietic stem cell quiescence in the bone marrow niche. Cell 118: 149-161. Matsuzaki, Y., K. Kinjo, R. C. Mulligan, H. Okano. 2004. Unexpectedly efficient homing capacity of purified murine hematopoietic stem cells. Immunity 20: 87-93. Kawazu, M., T. Asai, M. Ichikawa, G. Yamamoto, T. Saito, S. Goyama, K. Mitani, K. Miyazono, S. Chiba, S. Ogawa, et al 2005. Functional domains of Runx1 are differentially required for CD4 repression: TCRβ expression, and CD4/8 double-negative to CD4/8 double-positive transition in thymocyte development. J. Immunol. 174: 3526-3533. Szilvassy, S. J., R. K. Humphries, P. M. Lansdorp, A. C. Eaves, C. J. Eaves. 1990. Quantitative assay for totipotent reconstituting hematopoietic stem cells by a competitive repopulation strategy. Proc. Natl. Acad. Sci. USA 87: 8736-8740. Cai, Z., M. de Bruijn, X. Ma, B. Dortland, T. Luteijn, R. J. Downing, E. Dzierzak. 2000. Haploinsufficiency of AML1 affects the temporal and spatial generation of hematopoietic stem cells in the mouse embryo. Immunity 13: 423-431. Talebian, L., Z. Li, Y. Guo, J. Gaudet, M. E. Speck, D. Sugiyama, P. Kaur, W. S. Pear, I. Maillard, N. A. Speck. 2006. T lymphoid, megakaryocyte, and granulocyte development are sensitive to decreases in CBFβ dosage. Blood 109: 11-21. Ema, H., H. Nakauchi. 2000. Expansion of hematopoietic stem cells in the developing liver of a mouse embryo. Blood 95: 2284-2288. Wilson, A., A. Trumpp. 2006. Bone-marrow haematopoietic-stem-cell niches. Nat. Rev. Immunol. 6: 93-106. Lutterbach, B., S. W. Hiebert. 2000. Role of the transcription factor AML-1 in acute leukemia and hematopoietic differentiation. Gene 245: 223-235. Hanai, J., L. F. Chen, T. Kanno, N. Ohtani-Fujita, W. Y. Kim, W. H. Guo, T. Imamura, Y. Ishidou, M. Fukuchi, M. J. Shi, et al 1999. Interaction and functional cooperation of PEBP2/CBF with Smads: synergistic induction of the immunoglobulin germline Cα promoter. J. Biol. Chem. 274: 31577-31582. Pardali, E., X. Q. Xie, P. Tsapogas, S. Itoh, K. Arvanitidis, C. H. Heldin, P. ten Dijke, T. Grundstrom, P. Sideras. 2000. Smad and AML proteins synergistically confer transforming growth factor β1 responsiveness to human germ-line IgA genes. J. Biol. Chem. 275: 3552-3560. Zhang, Y., R. Derynck. 2000. Transcriptional regulation of the transforming growth factor-β-inducible mouse germ line Ig α constant region gene by functional cooperation of Smad, CREB, and AML family members. J. Biol. Chem. 275: 16979-16985. Martensson, A., X. Q. Xie, C. Persson, M. Holm, T. Grundstrom, I. L. Martensson. 2001. 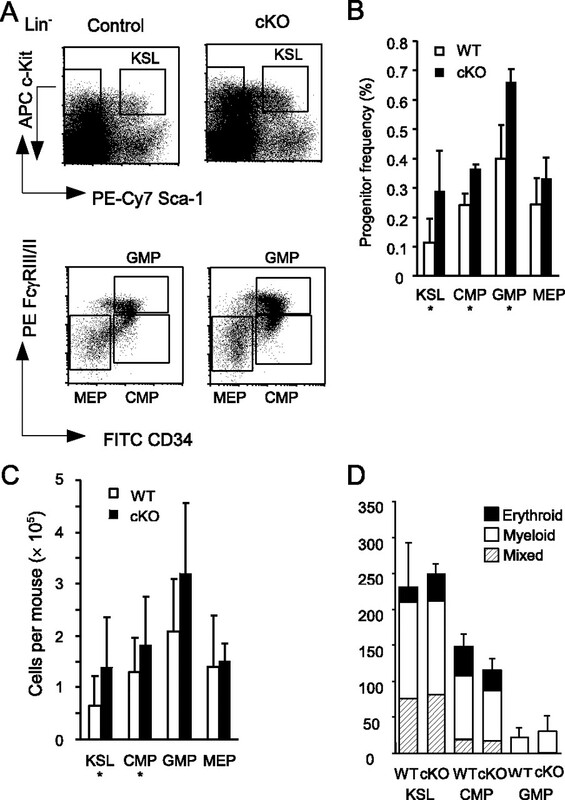 PEBP2 and c-myb sites crucial for λ5 core enhancer activity in pre-B cells. Eur. J. Immunol. 31: 3165-3174.